OBJECTIVE: Signet ring cell carcinoma (SRCC) of breast is a rare subtype with aggressive clinical course. The prevalence of signet ring features is between 2 to 4.5% of total breast cancers. Here we analyzed clinical and pathological features and outcomes of our patients with SRCC of breast. 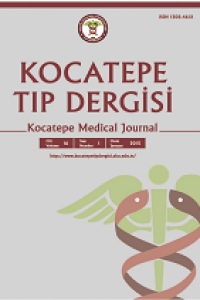 MATERIALS AND METHODS: We investigated retrospectively medical charts of 3587 patients with breast cancer diagnosed and treated in Hacettepe University Cancer Institute between 2007-2014. Patient demographics, pathology reports were assessed along with clinical outcomes. RESULTS: Twenty five patients with SRCC were identified (1%) Median age was 53 years and 48% of them were premenopausal. At initial diagnosis, metastatic disease was seen in 4 patients, other 21 patients have localized disease. Tumors were mostly grade 2, ER positive and Her2 negative. In patients with mixed histology, co-existed histology was invasive ductal carcinoma in 9 patients and invasive lobular carcinoma in 6 patients. Median follow up was 27 months. Seven patients had recurrence (1 local, 1 both local and distant, 5 distant). Most common site of distant relapses were bone, liver and ovaries (3, 2 and 2 patients, respectively). CONCLUSION: In this study, the prevalence of SRCC was found 0.7 %, which is lower than that reported in the literature. Invazive ductal carcinoma is the most common accompanying subtype. Ovarian metastases were found in 2 of 7 distant failures. Signet ring cell histology may have a predilection for ovarian metastases. AMAÇ: Memenin taşlı yüzük hücreli karsinomu agresif klinik gidişatı olan nadir bir alt gruptur. Meme kanserlerinin %2-4.5’ini oluştururlar. Bu çalışmada taşlı yüzük hücreli meme kanseri olgularının klinik ve patolojik özelliklerini analiz ettik. GEREÇ VE YÖNTEM: 2007-2014 tarihleri arasında Hacettepe Üniversitesi Kanser Enstitüsü’nde meme kanseri tanısı alan ve tedavi edilen 3587 hastaya ait veriler incelendi. Hastaların demografik özellikleri ve patoloji raporları, klinik sonuçlarla birlikte değerlendirildi. BULGULAR: Taşlı yüzük hücreli meme karsinomu olan 25 hasta bulundu (%1). Ortanca yaşları 53 olan bu hasta grubunun %48’i premenapozal dönemde tanı almıştı. Tanı anında 4 hastanın metastatik, diğer 21 hastanın ise lokal hastalığı vardı. Tümörler genellikle grade 2, ER pozitif ve HER2 negatif idi. Mikst histoloji tespit edilen hastalardan 9’unda invaziv duktal karsinom, 6’sında invaziv lobüler karsinom eşlik etmekteydi. Ortalama takip süresi 27 ay idi. Yedi hastada nüks gözlendi (1 lokal, 1 hem lokal hem uzak, 5 uzak). Kemik, karaciğer ve overler en sık uzak nüks saptanan organlar idi (sırasıyla 3, 2 ve 2). SONUÇ: Bu çalışmada, taşlı yüzük hücreli meme karsinomu prevalansı literatürden daha düşük olarak bulunmuştur (%0.7). İnvaziv duktal karsinom en sık eşlik eden tiptir. Uzak nüksü olan 7 hastadan 2’sinde tutulan organ overdir. Taşlı yüzük hücreli karsinom olgularında over metastazı ile karşılaşılabilir. 1. Middleton LP, Palacios DM, Bryant BR, Krebs P, Otis CN, Merino MJ. Pleomorphic lobular carcinoma: morphology, immunohistochemistry, and molecular analysis. The American journal of surgical pathology 2000;24:1650-1656. 2. Steinbrecher JS, Silverberg SG. Signet-ring cell carcinoma of the breast. The mucinous variant of infiltrating lobular carcinoma? Cancer 1976;37:828-840. 3. Merino MJ, Livolsi VA. Signet ring carcinoma of the female breast: a clinicopathologic analysis of 24 cases. Cancer 1981;48:1830-1837. 4. Hull MT, Seo IS, Battersby JS, Csicsko JF. Signet-ring cell carcinoma of the breast: a clinicopathologic study of 24 cases. American journal of clinical pathology 1980;73:31-35. 5. Wu X, Zhang Z, Li X, et al. Poorer Prognosis of Primary Signet-Ring Cell Carcinoma of the Breast Compared with Mucinous Carcinoma. PloS one 2016;11:e0162088. 6. Liu SM, Chen DR. Signet-ring cell carcinoma of the breast. Pathology international 2000;50:67-70. 7. Kondo Y, Akita T, Sugano I, Isono K. Signet ring cell carcinoma of the breast. Acta pathologica japonica 1984;34:875-880. 8. Koos L, Field RE. Metastatic carcinoma of breast simulating Crohn's disease. International surgery 1980;65:359-362.